02-Jan-2004 -- The visit to this confluence point was the result of a decision to visit another point, 21S 26E, in Botswana. There are various routes to Sowa Pan and the one we choose went within 15 km of 23S 27E. Two vehicles left Pretoria, South Africa, on 2nd of January 2004 at 05h00 with the idea to visit five confluence points within four days: 23S 27E, 23S 26E, 22S 26E, 22S 25E, and 21S 26E. After crossing the border at the Parr's Halt/Stockpoort border post, we followed the main road to Mahalapye. The first section was gravel but then joined a tar road taking us to within 15 km, to the south, of the confluence point. Many tar roads in Botswana are not fenced but this particular section was fenced with gates every few kilometres. Once through the gate we followed various jeep tracks and very faint roads to within 2.5 km of 23S 27E. 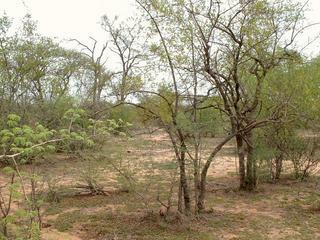 From here we had to bundu bash our way through thick thorny bush vegetation in order to reach our destination. We are very aware of possible damage caused to the environment by driving off the road but in these areas we considered the damage caused to be minimal and not of a permanent nature. The area is being used for stock farming and therefore the land is fully utilized with cattle tracks going everywhere. A set of vehicle tracks would not be visible for more than a few days. The vegetation is also very hardy and the vehicles were more likely to be damaged by the thorns and branches from the bush than the vegetation being permanently damaged by the vehicles. There are no fences, apart from the fence next to the tar road. This made it easy to get close to the point but it also made it difficult to determine whom the land belonged to in order to ask permission. We did however not see many people and the few we did come across were extremely friendly and waved us on with big smiles. We have travelled the more remote parts of Botswana many times and have found the local people to be very friendly and hospitable. Botswana is a beautiful country with lots to offer the visitor, especially if you are a nature lover and want to get away from the city.